St. Edward’s University’s men’s basketball team reached the NCAA’s Division II “Sweet 16,” and posted a 30-4 record for the 2018-19 season. Things were hopping on the Hilltoppers’ campus in south Austin. That’s the kind of success Ryan Garza is used to. The super sophomore was a big part of St. Edward’s deep run. The 6-foot-1 guard scored nearly 13 point per game in the playoffs – close to double his regular-season average – and was the team’s sixth-leading scorer while coming off the bench. His dead-eye, 41-percent shooting from behind the arc was the team’s top by far and among the Heartland Conference’s best, and the Edinburg Vela product improved his free-throw shooting by 10 percent to 87.8 (best on team). Garza’s best game came against Rogers State (Oklahoma) on February 13 when he scored 21 points in 15 minutes going 8-for-9 from the field. He ended up posting 7.5 points per game on the season. 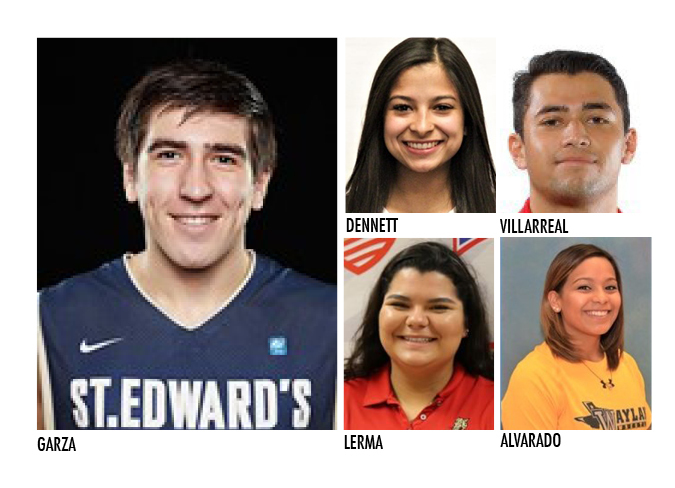 St. Edward’s was knocked out of the tournament by West Texas A&M, but the Hilltoppers have all but one player coming back for next season. This season’s success is quite a turnaround from last year when Garza struggled as a freshman. He shot just 27.6 percent from three and scored just 3.2 points per game. But Garza persevered and was up for the challenge. His shooting improved. Garza became an integral player off the bench and played a key role in the Hilltoppers’ success. One they hope replicate next year and go ever further. Edinburg North’s Haley Dennett’s mark on the Concordia University softball program is indelible. The senior shortstop is a four-year starter and before the season’s over will be one of the most prolific players ever to suit up for the Tornados. Dennett will likely be in the program’s top 10 for most games played, most games started, most hits and highest batting average among other categories. This season, Dennett, an All-Conference selection in 2018, is batting a team-leading .382 for 10-12 Concordia. The 5-foot-6 Kinesiology major has banged out 26 hits, scored 11 runs and posted 10 RBIs in 22 games played. And Dennett has improved in the field. The shortstop has connected on 77 of 82 chances with just five errors for a .939 fielding percentage. Versus McMurray on March 15, Dennett went 3-for-5, smacked a double, scored two runs and got two RBIs while picking up all five chances in the field. Brownsville Veterans Memorial product Fred Villarreal has officially turned to corner. The junior pitcher has markedly improved in nearly every category over last year and his freshman campaign. The University of Houston middle reliever’s ERA is down to a very stingy 1.05 from 4.43 last season. Villarreal, a 5-foot-11 junior, sports 2-0 record with three saves. The right-hander, through last Saturday, has made 11 appearances, pitched 25 innings and faced 101 batters. Meanwhile, he’s allowed just 19 hits, six runs and no home runs while surrendering a paltry seven walks and striking out 21. Opponents’ batting average when he’s on the mound is .207 (.302 in 2018). The Cougars are 11-10 overall and opened American Conference play last weekend. For her outstanding play in leading the Jaguars to a second-place finish at the Bellevue Spring Break Classic, Mission High’s Leah Lerma was named the Sooner Athletic Conference Women’s Golfer of the Week for March 4-10. Lerma, a sophomore at UH-Victoria, opened the tournament with her collegiate low round posting a two-under par 71. In that tourney, Lerma finished with her career low 36-hole total of 155 to place third. Her score also helped the Jaguars post their lowest 18-hole and 36-hole tournament scores (329-331) in five years. It was Lerma’s first top-10 finish of the season. Last year she was named UHV’s team Player of the Year and Newcomer of the Year. McAllen Memorial alum Amanda Alvarado earned All-American status by finishing in eighth place at the WCWA national championship college wrestling tournament on February 8-9. The sophomore, wrestling in the 130-pound division for Wayland Baptist University, got a bye in the first round then posted wins in the next two matches to get herself into the elite eight. She dropped the next bout, but the first eight places were named All American by the Women’s College Wrestling Association. Wayland Baptist is an NAIA school located in Plainview in the Texas panhandle. The Pioneers have a highly-regarded program and have been ranked as high as No. 2 and finished in seventh place at the NAIA National Invitational. Alvarado is 3-5 this spring according to WCWA.